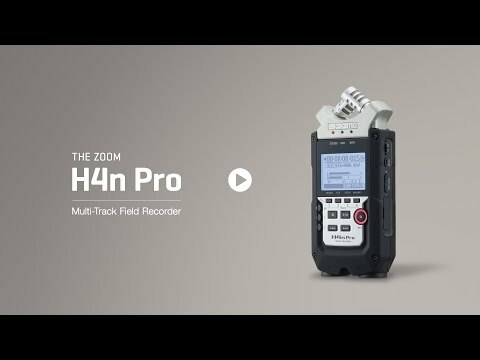 The H4n Pro provides the essential combination of mic’ing versatility, portability, and superior audio necessary for impactful storytelling. With support for plug-in power, you can use a lavalier to mic up your subject for podcasts or interviews. Record time-stamped WAV files to sync with video footage in post-production, or embed superior audio directly on your video in real-time through a ?"" stereo feed. The two locking combo connectors accept either XLR or ¼"" balanced/unbalanced phone cables, handling mic- and line-level signals as well as instrument-level signals. Phantom Power of +24 or +48 volts can be applied to both inputs. Plus, there’s a stereo 1/8” Mic jack for external audio sources, including lavalier microphones requiring 2.5 volts of plug-in power. A stereo ?"" Line/Phone Out, with dedicated volume control, allows for headphone monitoring or connection to your DSLR, while the built-in monophonic speaker allows for quick playback reference. In addition, a USB port enables fast file transfer, firmware updates, and use as a 2-in/2-out audio interface for computers. One second when recording at 96k or working 4CH mode. Recording times are approximations. Actual times may differ according to recording conditions.